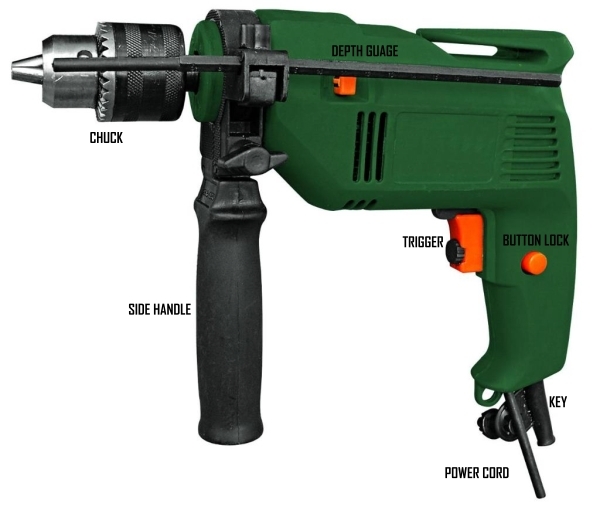 A drill is easily the most popular power tool in the world. It is used for a variety of purposes from drilling a hole in the wall to hang a picture to gouging mortises for joinery. Today, many households in India have a power drill for all the little jobs like drilling holes in walls, fixing kitchen and bath accessories, and attaching electrical fixtures. 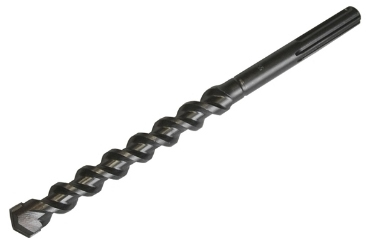 Many modern drills are of variable speed and can also be used as power screw drivers. Drills are versatile and with the right kind of accessory can also be used for sanding, cutting and polishing. The flexibility of the modern day power drill is enormous and it has really become a must have tool for the home DIY. To get the most out of a power drill, proper bits and accessories are essential. The right accessory or bit can greatly enhance the usefulness of the drill. It is also necessary to know a little about bits and when and how to use them. Perhaps the first part of a power drill every user must be familiar with is its chuck or the part that holds drill bits and other accessories. The bit is inserted in the chuck opening and tightened by a key that is usually found attached to the bottom of the handle. The chuck should not be over tight and yet must not be loose. Improper insertion or tightening can be dangerous because a power drill rotates at very high speeds and the bit could break or come loose and cause injury or damage. In Figure 1, the chuck is of the traditional type and is tightened with a key. Below is a photograph of a traditional chuck and key. The drill bit is inserted in the mouth of the chuck and the key is inserted in the hole of the chuck and tightened or loosened. In the key system, the chuck has to be tightened so that the bit does not slip or fly out during operations. Users often tend to tighten the chuck with as much force as possible which is not required and nor is it entirely a good idea. For, this puts more than optimal pressure on the internal vice and collar during operations which cause vibrations and stress. 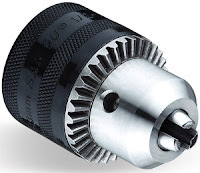 A better system is one where the chuck is tightened by hand and is called the keyless chuck. 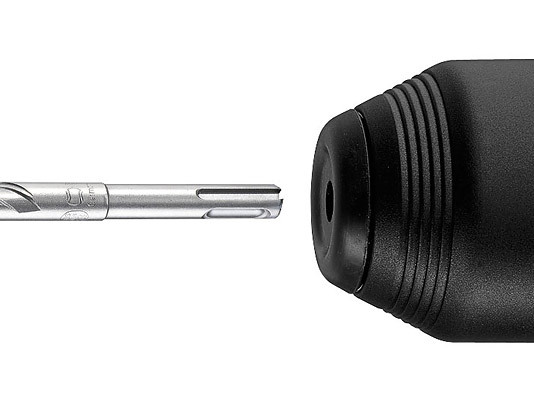 This is a more recent innovation and keyless chucks are only found in newer drill machines. These chucks use regular smooth bore drill bits and accessories. The vice at the mouth of the chuck opens and closes by simply turning the bottom sleeve. No key or force is required for this simple operation. These kinds of chucks are clearly desirable but most drill do not come with them. Some companies in the US advertise keyless chucks that could be retrofitted on older drill machines. There is yet another more recent type of chuck called the SDS chuck. SDS is the abbreviation for "Special Direct System". This allows easy change of bits and other accessories without the use of a key. 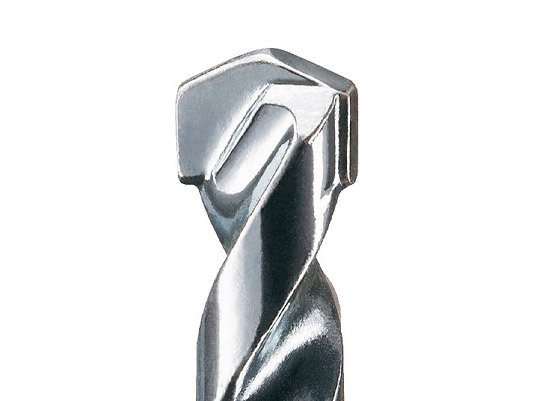 The bit or other accessory can simply be pushed in to insert and can be extracted by twisting the chuck. This system was developed by Bosch power tools to enable tool-free changing of accessories. The photographs below illustrate this. Note the special notches at the end of the SDS type bit that are required to fit in an SDS chuck. Normal bits (as if Figure 4 above) are smooth and cannot be fitted on SDS chucks. These drill bits are more difficult to get in India although Bosch has introduced some of these machines. 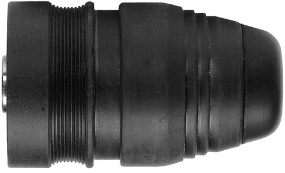 This type of bit and chuck is usually used for the larger hammer drills. The SDS chuck has no key or jaws to hold bits. It’s a completely different system and a useful innovation. An SDS bit can easily be inserted directly into the SDS opening and it will click into place. To remove the bit, the SDS chuck has merely to be twisted and the bit pulled out. 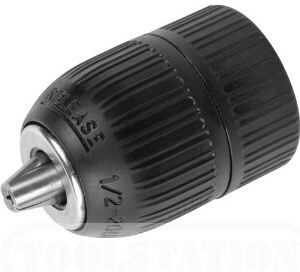 Not only is this an amazingly simple operation but it also obviates the necessity of applying the right torque as in a keyed chuck. The other factor one must consider when using power drills is using the right attachment for every job. This is true even for straightforward drilling operations. The drill bit must be appropriate for the kind of material being drilled. Concrete needs to be drilled with high speed steel (HSS) or carbide tipped masonry drill bits and that too inserted in an impact drill or the heavier hammer drills. Trying to drill holes in concrete with a regular masonry drill and power drill can be an extremely frustrating experience as I had once discovered. I had to level a concrete edge in my balcony in order to re-plaster the ledge. When all efforts with a regular drill failed, I had to purchase a powerful hammer drill and a specialized, and needless to say, pretty expensive carbide tipped bit. But the investment paid for itself. The hammer drill just bored its way through the tough concrete with minimal effort, surprising the masons who had never seen anything like it! I still use the hammer drill for drilling into concrete, steel or hard plaster. Drill bits can be broadly divided into four categories. There are more types but those I will discuss in a later article. For most practical purposes these four types will suffice. The first type is the one used for drilling into masonry, plaster, brick, hollow concrete blocks, tiles etc. 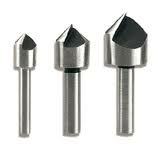 These are the masonry bits and they usually have a broad, blunt looking tip. Sometimes, manufacturers mark such bits with a blue colouring. The second type is meant for drilling in wood. This is actually a whole class of bits made up of very different tips and sizes for a variety of jobs. The point to note is that these bits need to be much sharper than masonry or metal boring bits because they have to cut clean and fast through wood which is a softer material and can be burned by the bit, which heats up rapidly during drilling. The other feature of these bits is their sharp point. This end digs into the wood or a pilot hole to grip the surface and guide the rest of the bit in. These bits are often coloured black and are also known as brad bits. The third type is for drilling in metals. Non-ferrous metals such as copper, tin and aluminium are much softer than iron and steel. For the harder metals, the drill bit must be made of high speed steel and not the cheaper carbon steel that is commonly used. Some of the more expensive metal working drill bits are made of tungsten carbide. 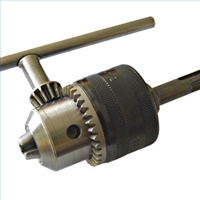 The fourth type of commonly used bit is the ones for drilling in ceramic tiles or through glass. These bits are very different and have no spiral grooves on them. For efficient drilling, start with a slow speed and gradually increase the speed once the surface has been pierced. Starting at a high speed can cause the bit to slide across the smooth surface of the tile or glass. Another way to prevent slide is by sticking some masking tape on the surface of the tile and then drilling. The photograph on the left illustrates three types of popular drill bits for woodworking. 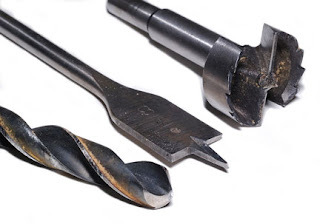 The first from the left is a spiral twist bit that is used commonly for drilling holes to make mortises; the second is a spade bit for making large holes and third type is a Forstner bit named after its inventor Benjamin Forstner. The last bits are very effective for drilling clean large holes in wood. The spade bits are much cheaper but ten to splinter the wood while drilling. 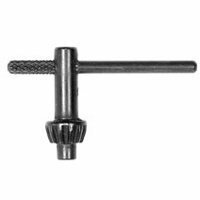 Another popular type of bit is the counter sink bits, which are used to drill a gouge in wood or metal to seat the head of a screw. 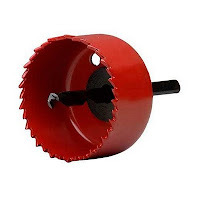 Another class of drill accessories are the Holesaws or hole cutters. These are specialised bits for cutting large holes in wood, metal and masonry. 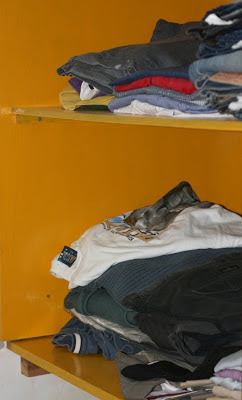 A typical use is for making holes in doors to fit locks. A holesaw typically consists of a steel cylinder with serrated teeth on its cutting edge and a pilot bit running through its centre. The pilot bit centres the holesaw and keeps it in position while drilling. 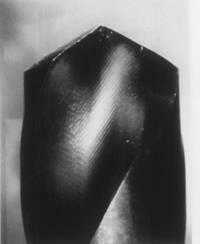 Holesaws are normally made of high speed steel; the ones for boring through masonry usually have diamond tipped teeth. A powerful drill and a steady hand is required for these drills. Generally it is a good idea to hold the drill perpendicular to the surface being drilled unless you are deliberately trying to drill at an angle as when inserting a pocket hole. Also make sure that you do not try to bend the drill bit while drilling. This can prove dangerous for a weak bit could snap. Also, it is generally not a good idea to broaden the width of a hole by rotating the drill along its edges. The result hole is usually neither clean nor accurate. It is better to match the desired hole size with the bit diameter. S plug, known locally as a gitty! I often have to drill holes in my walls to hang a framed painting or attach some fixture. I use what Indian carpenters call a plastic “gitty” to fix screws securely to the wall. A gitty is actually an S-plug and is extremely strong when inserted properly. Use a masonry drill of the same diameter as the S-plug and drill a little deeper than the length of the plug. Clear the hole of all debris and loose plaster; insert the S-plug and then insert an appropriate size screw which should ideally be screwed in. Such a plug and screw combination can take a fair amount of load. 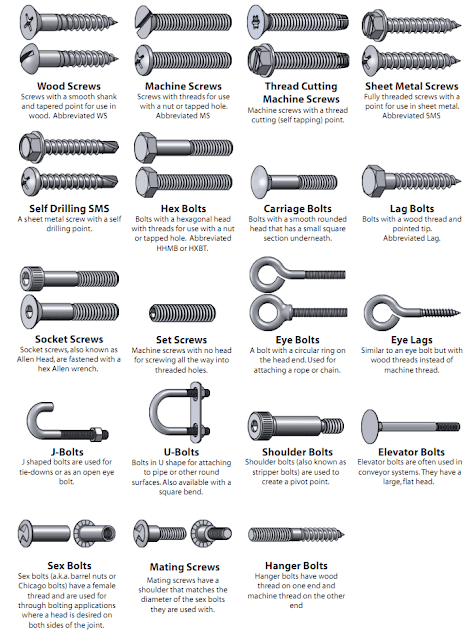 There are deeper and wider plug-screw combinations for greater loads and heavier fixtures such as bookcases and wall mirrors. My other suggestion is to buy good quality drill bits, even if they are more expensive than the so called “local” ones or the Chinese ones. 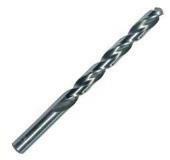 Cheaper drill bits are often made of poor quality carbon steel and can get dulled very fast. They are also liable to snap. Good quality bits not only last longer but also cut cleaner. Bosch has introduced a number of fairly priced drill bit sets in the Indian market for a variety of operations, including wood boring, masonry drilling, metal working and the ceramic drilling. The ones that come in sets are cheaper and more convenient because the bits come in a succession of sizes. My last tip is please wear safety glasses while drilling. Bits of wood, plaster or metal can damage the eye permanently. Every Do It Yourself person must make safety his first priority. Good luck! * PLEASE NOTE that I do not accept any responsibility for the completeness and correctness of the instructions given here. I would also like to point out that you use these instructions at your own risk. For your own safety, please take all the necessary precautions.